Not just biohazards but also toxic waste. So, on Monday the vet said the cat should have a blood test for lead poisoning, but the painters are taking more care with their clean-up now and our GP said we and the kids needn't be tested. On Tuesday Iris joined Hazel with a chest infection of her own. One should learn early not to try to get everything one's sister has; my sister has an IT management job and twins. Today was a good day. Hazel and Iris visited my parents in the morning and all seem to have had a lovely time. I had a coffee and an interesting chat with my cousin about what "spiritual health" might be in a wholly material world-view (some kind of moral and emotional well-being based on realistic optimism). Hazel was well enough to do her ballet lesson. The vet just rang and Moab doesn't have lead poisoning, what it is that's made him have a bad tummy for three and a half weeks we still don't know, nor is he yet better. Thank you Sir Alexander Fleming. Eighty years ago I might have lost my cat, a child, or my sight. Now it's just inconveniently complicated enough that I'm going to have to write a spreadsheet to tick off when each person gets their medicine. We'd put Moab in the vet's cattery because when we left he'd already been ill for a couple of weeks. We got him back with another six days of antibiotic; he's improving but had diarrhoea a day or two ago. Poor old Hazel, she was coughing and coughing and kept Sean awake last night; it turns out she has a lung infection so she has Gee's Linctus and Amoxycillin. Iris's eyes are now improving but three times a day they need swabbing with a solution of 1t baking soda, 1t salt, and half a cup of cooled boiled water and then she gets her Soframycin drops. I have the same eye regime as Iris, and some spray for athlete's foot. Sean seems to have got by with only the tinea so he'll be okay to go to work. The rest of us are not going out to help these bacteria divide and multiply. We are staying home, watching movies and playing with things we haven't had access to lately, like the computer. Me, Iris, and the pool before we got conjunctivitis. Iris enjoying spaghetti and sunset despite being allergic to the antibiotic cream she was taking for her conjunctivitis. Sean and Hazel on the glass-bottomed boat. Hazel and a bird eyeing each other up at the rather good Kula Eco Park. The dark red glare as of the dying sun of Charn. We're back and I have too many stories to easily tell any of them. My favourite was swimming at night; in the warm sea under bright stars watching bats whose wild flapping flight was accompanied by the guitars at the nearby beach bar and grill. My least favourite is that Hazel's really quite allergic to something, probably coconut. Iris is certainly allergic to Chloramphenicol. Conjunctivitis is terribly trendy in Fiji this year and Dr. Dasi at The Fijian resort is lovely. The Magician's Nephew is still my favourite one of the Narnia chronicles and Hazel had it read to her all week. When I wasn't reading that I read The Coyote Kings of the Space-Age Bachelor Pad which was a thoroughly enjoyable and fairly demanding book. Fly away, into the blue skies. Fly today, into the blue skies. Airway spies da da da dum dum. Fiji, last year the girls thought it was heaven. Security is having something to play with upon waking. Hazel's caterpillar was a beautiful caterpillar, furry and black with bright orange stripes. 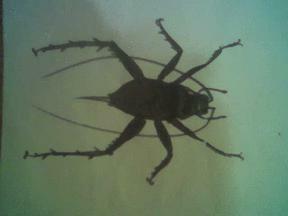 I identified it with the aid of Andrew Crowe's Which New Zealand Insect and Manaaki Whenua's "What is this bug?" as a woolly bear caterpillar and predicted that it would grow up to be a Magpie Moth (Nyctemera annulata). After it had been collected from a plant in the garden and named "Hazel's caterpillar" it lived happily in the pasta sauce pottle with pierced lid that we keep very small and stupid pets in. She was proud of its voracious appetite and its growth. We were very excited when one day it had started spinning silk and hanging from the ceiling of its room. I read to Hazel about Bella and Rosa's caterpillar's chrysalis and showed her the photos while we waited for it to make a coccoon. The next time we looked in the caterpillar had not made a coccoon but was lieing still on the floor of the pottle and some little fuzzy egg thingys had appeared beside it. Hazel thought that maybe it was a Mummy caterpillar! I thought that it was more likely to be a parasitoid because if the woolly bear was interestingly neotonised to the extent that the caterpillar laid eggs then the sources I'd used for identification would have mentioned the fact and they hadn't, but neither did I manage to find what those thingys were. We waited for more data. 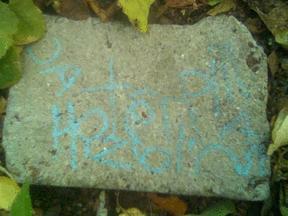 As we waited Hazel's caterpillar shrank, lost its orange stripes and smelt dead. The loss of the orange stripes was what brought Hazel to the theory that the little thingys might be bad thingys that eat caterpillars. Idly reading my childhood copy of John Salmon's Butterflies of New Zealand (A.H. and A.W. Reed 1964) I read there are tiny insects called Chalcids which lay their eggs in live Cabbage White caterpillars and that on hatching they eat the host. Taking that back to Manaaki Whenua I found that Chalcids are wasps (Chalcidoidea (Insecta: Hymenoptera)), and taking that back to Andrew Crowe's Which New Zealand Insect I discovered that other wasps, particularly Ichneumanids, lay their eggs in chrysalises and caterpillars too. I want you to tell all the Playcentre Mummies and Daddies that my caterpillar is dead and to write it on your blog so that other people can know too. I expect she'll ask me to read her any comments. We went camping with the kids. They loved it, especially the river and the other children from Playcentre who were there. I liked it too, but I'm proof-reading a research report this weekend and so when everyone else was hiding and running and wading I was sitting around like the worst sort of grown-up doing some work. But we've done it once now and we have our own tent, we can do it again when I'm free. Hurray hurray hurray. I'm very pleased with this weta. Lacking the time this week to draw in jam for ants to come and be the medium for Illustration Friday's Insect theme I hastily drew a weta using the photo on the cover of Andrew Crowe's Which New Zealand Insect . 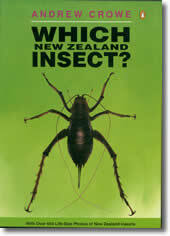 An awesomely good book if you or anyone in your household has any curiousity about insects in New Zealand. I'm glancing through Mrs. Beeton's Book of Household Management. It was first published in 1859-61. She claims (item 1815) that "An excellent substitute for milk or cream in tea or coffee" is an egg! One per large breakfast-cup, beaten in a basin and poured over the very hot drink, very gradually and stirring all the time to prevent it curdling. Am I brave enough to try it? He looked up; and she was instantly scarlet, as though she had been dipped in boiling water. Through the confusion of her darkened eyes ahnd drumming ears some enormous bulk seemed to stoop over her. Then the mist cleared. His eyes were riveted on the manuscript again, but he breathed as though he had been running. She had once again lost all consciousness of him except as the familiar intelligence that lived and moved so curiously behind an oddly amusing set of features. 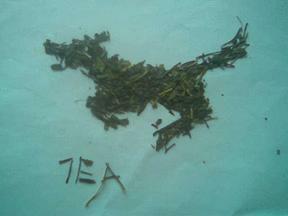 My tea-drinking friend Gillian's dog Cory is a flat coated retriever and we used to take her down to the lake together and throw sticks into the water. Upon seeing a stick being thrown into water for retrieval Cory gallops to the edge of the bank and launches herself into the air to float for a moment before plunging in with a gigantic Sploosh! These days I'm drinking green tea. It's antioxidant properties make it more likely that my cervix will now stay uncancerous. Knowing that makes it taste a bit better. The medium for this picture was Sencha. Trajectory and the ouchy elbow. I was watching them do schemas in the bath. Hazel was spraying the bubbles up into the air with a plastic fork. Iris was coating herself with them. Suddenly Iris started crying. I crouched down and asked "What happened Iris?" In tones of deep tragedy "My elbow ouchy," she replied. "Oh, did it bump on the side of the bath?" "Oh. You poor thing. Is it okay now?" "Hazel, I think you should talk to Iris about her elbow." "Iris, how does your elbow feel?" "What kind of hurt, is it bleeding kind of hurt?" "Can I see it?" she asked with interest. "Okay." Iris showed her the elbow, it was definitely the bubbles kind of elbow and so may well have been suffering the bubbles kind of pain. "No! Not you kiss my ouchy elbow!" Iris spit back vehemently. "Oh," Hazel, a little rebuffed, to aid her thought processes, flicked the bubbles gently, "does it need a kiss from your Mummy?" "No..." Iris raised a smiling face to her, "I fine."